Washington D.C. – The Postal Service has announced more subjects that will be featured on Forever stamps in the new year. One of them, in particular, is near and dear to our hearts. As part of their Statehood Series, there will be a 2017 forever stamp that celebrates the 200th anniversary of Mississippi statehood. Mississippi became the 20th state on Dec. 10, 1817. The stamp features a 2009 photograph showing a close-up of a guitar player’s hands. 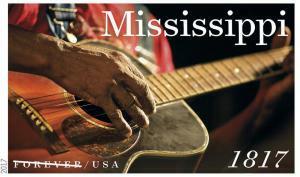 Mississippi is the birthplace of many legendary blues artists who created a uniquely American genre of music. Among states, the Magnolia State is 32nd in size, and with nearly three million people, it ranks 31st in population. Art director Greg Breeding designed the stamp with an existing photo taken by Lou Bopp. Bopp is a professional photographer, who, in 2009, made a pilgrimage to the Delta in order to photograph some of the living legends of the blues. In an interview with Slate Magazine, he said, “A lot of these guys are old, and I tried to shoot as many as I could before we lose them all. A lot of these guys I shot are as good as B.B. King—they just don’t have the same notoriety. I think they’re just as important to the genre.” That’s where the guitar player’s hands come into play. The guitarist featured on the new stamp is none other than Bentonia blues artist, and owner of the Blue Front Cafe, Jimmy “Duck” Holmes. Holmes was 62 years old at the time, and is one of the last living practitioners of the Bentonia blues style. Although he has been playing all his life, he released his first album, Back to Bentonia, on the Broke & Hungry Records label in 2006. Since that time, he has released five additional albums. He was one of several Delta area blues artists that Bopp photographed during his stay in Mississippi. Others included Big George Brock, Super Chikan, T-Model Ford, Pat Thomas, Elmo Williams, and some 70 more.